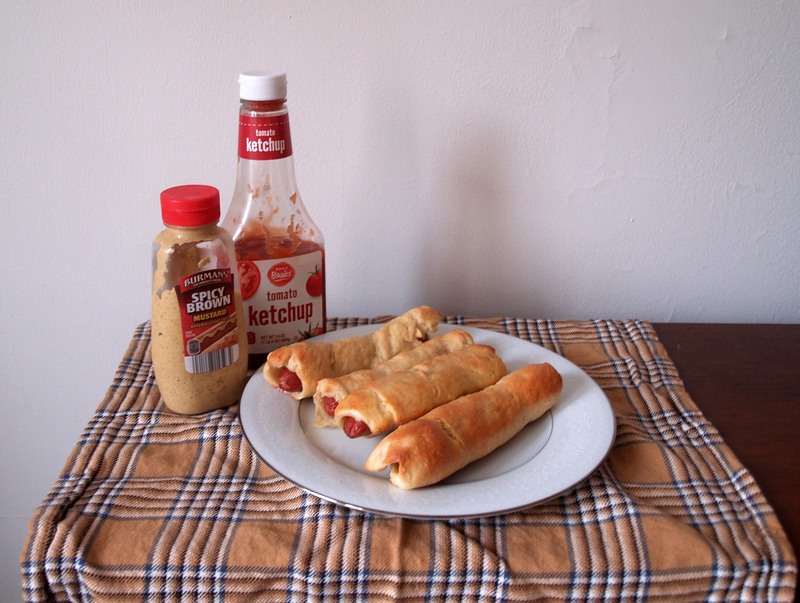 Bagel Dogs | I Wanna Bake! For those not in the know, as I wasn’t 7 years ago, bagel dogs are essentially pigs in a blanket, but with a bagel shell instead of biscuit or pastry. I’m sure other companies make them, but the only ones I’ve ever seen are made by Vienna Beef, which doesn’t seem to have made its way to Cleveland yet. This poses a problem, because bagel dogs are one of my husband’s favorites. He asks for them every once in awhile, but since we can’t get them here (I’ve checked every grocery store I could think of), the obvious solution is to make them myself. I’ve been planning this one for awhile, but I finally got around to it over the weekend, thus ending the great bagel dog drought. I tried this with both full-sized hot dogs and mini hot dogs, and it worked out well both ways. 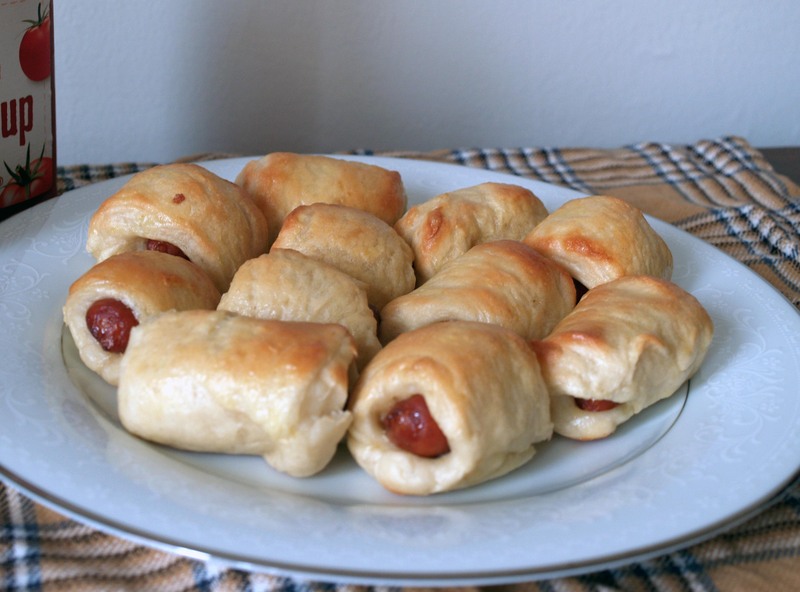 Mini hot dogs make for a good appetizer, while full-size hot dogs are more of a meal. If you use full-sized hot dogs, I recommend splurging a little and buying decent quality, all beef hot dogs such as Nathan’s or Hebrew National. Perhaps this is personal preference, but I thought they all beef hot dog tasted particularly good with its bagel blanket. The recipe for the bagel dough is a very slightly modified version of my favorite bagel recipe from Selections from Betty Crocker’s Cookbook. The original recipe calls for all all-purpose flour, but I like to do a 50/50 split with all-purpose and bread flour for a chewier texture. If you want to get crazy, you could even try it with my pickle bagel recipe, following the steps in this recipe once you’ve mixed the dough. 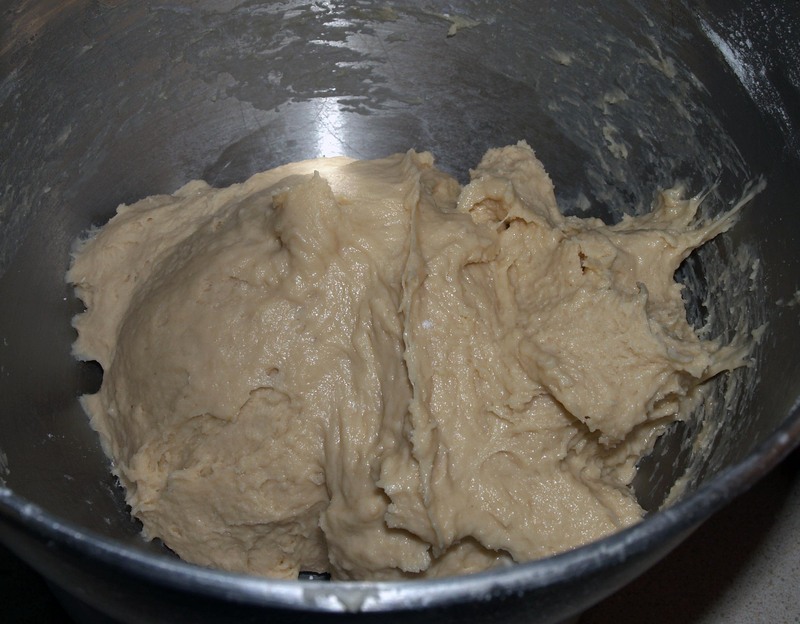 In general, you can mix in a small amount of anything you want into the dough as long as it doesn’t add too much moisture. You can also add poppy or sesame seeds, dried garlic or onion, kosher salt, or all of the above to make everything bagel dogs. Sure, this may not be as easy as opening a bag of Vienna bagel dogs, but what you sacrifice in time, you make up for with customizability. You’ll notice that right before baking, you have to boil the uncooked bagel dogs. This step is essential for getting the correct bagel texture for reasons you can read about here. 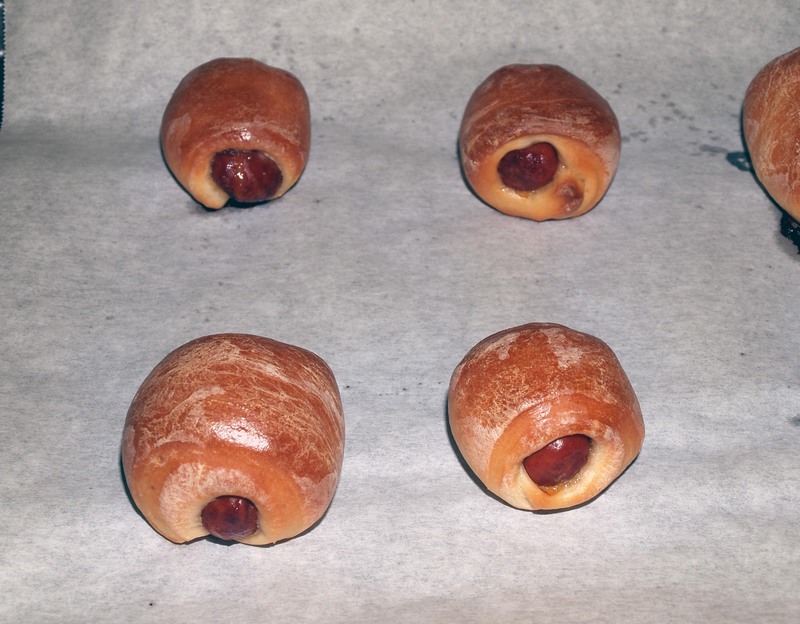 I tried 6 mini bagel dogs without boiling, just to see how they turned out, and while they were still edible, the result was less than optimal. The bagel shell was crumbly, and the outsides browned strangely (see photo below). Trust me, don’t skip this step if you want these to turn out right. These freeze and reheat really well. If you want to make a bunch in advance and freeze them, follow the recipe as written, then cool the bagel dogs completely. Once they’re cool, arrange them on a cookie sheet in a single layer and leave them in the freezer until they’re frozen solid. Then you can transfer them to your freezer containers of choice to save them for a future bagel dog craving. To reheat them, I microwave them between sheets of paper towel for 1 minute, or until they’re thawed but not hot, then bake them in the toaster oven for 5 minutes at 350°F (they’ll work the same in a regular oven as well). It may be a lot of prep work in the first place, but you’ll thank yourself when you have bagely, hot doggy goodness at the ready when you want it. To go with comfort food, I’m listening to comfort music. For me, that means I’m listening to my beloved funk every chance I get. Pick what makes you happy and bake with it! 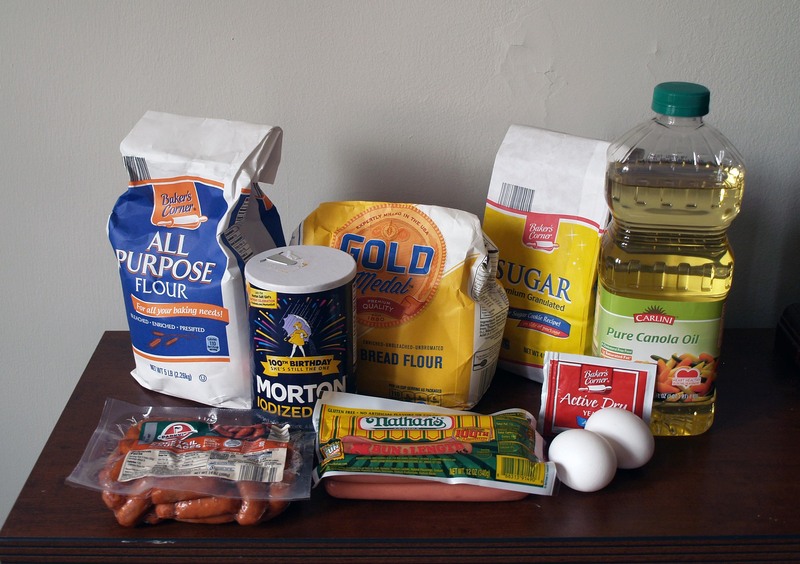 In the bowl of a stand mixer, stir 1 tablespoon of the sugar into the warm water until the sugar is fully dissolved. 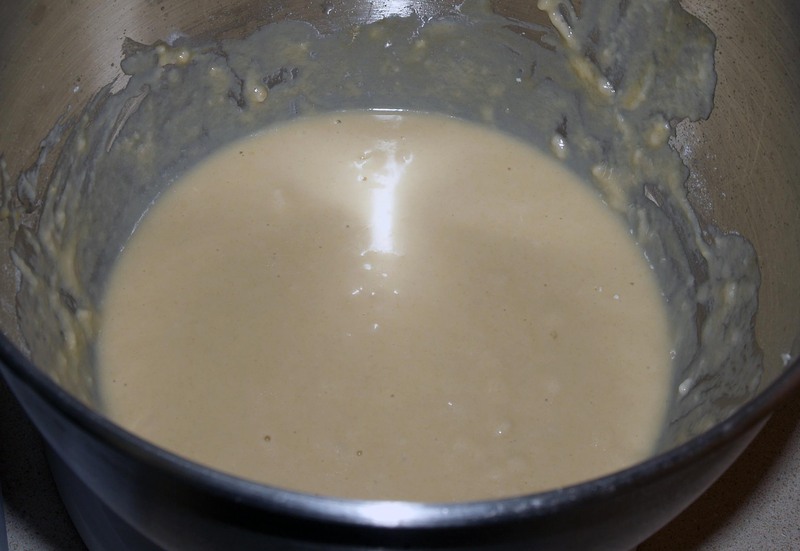 Sprinkle the yeast on top and let it sit for 5-10 minutes, or until it looks creamy (see before and after pictures below). Using a dough hook or a wooden spoon, stir in the vegetable oil, eggs, salt, and 1¼ cups of bread flour until you have a smooth slurry. Stir in the remaining flour, 1 cup at a time, and knead for 5-10 minutes (using the dough hook or by hand on a lightly-floured surface) until it forms a generally smooth dough. The dough will be a bit sticky. 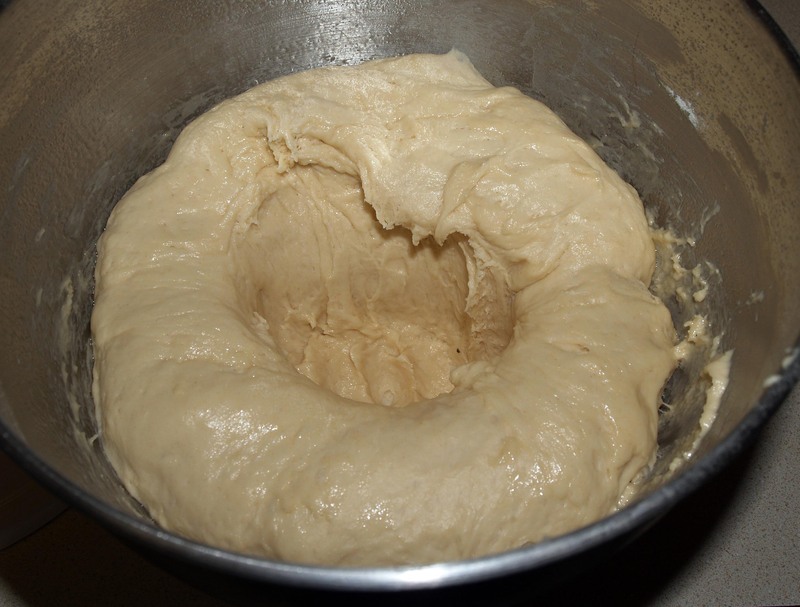 Place the dough into a greased bowl and flip it over once to coat both sides. 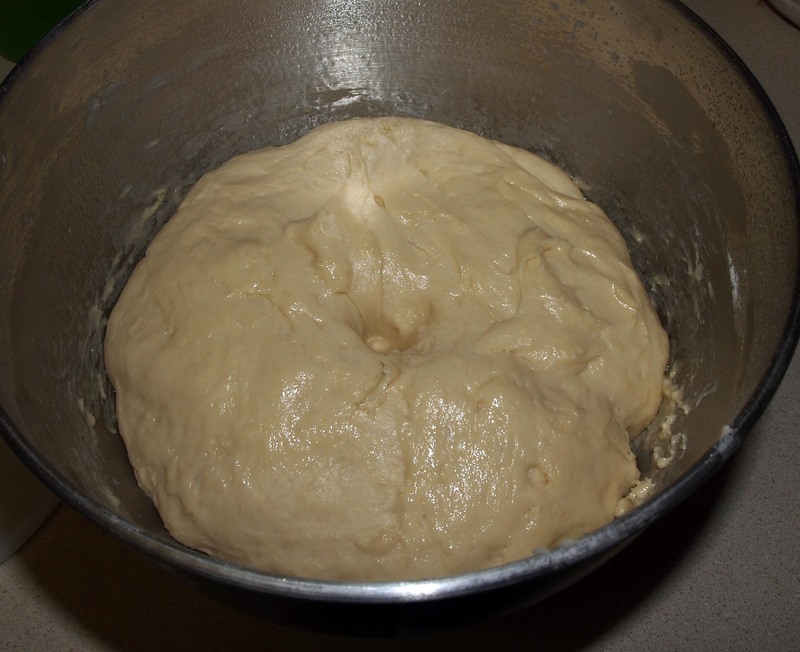 Cover the bowl and leave the dough to rise in a warm place for 45 minutes, or until doubled in size. 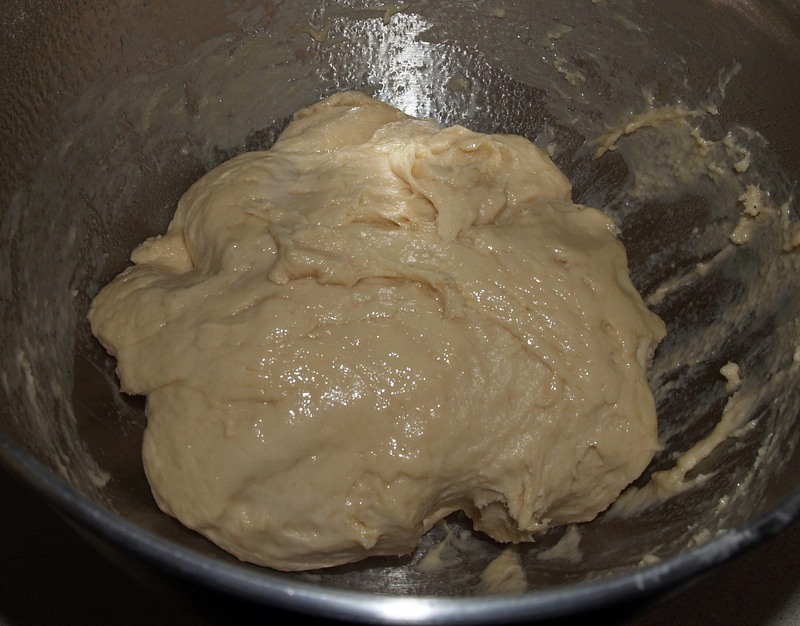 Your finger should leave an impression when you poke the dough after rising. 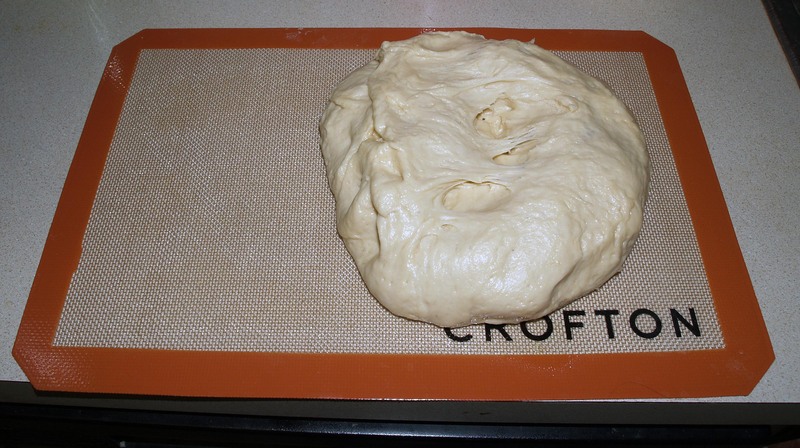 Turn the dough out onto a greased work surface (I like to work on a silicone mat). Cut the dough into 4 equal portions and set 3 aside for now. Pat the remaining portion into a 6″ by 14″ rectangle. 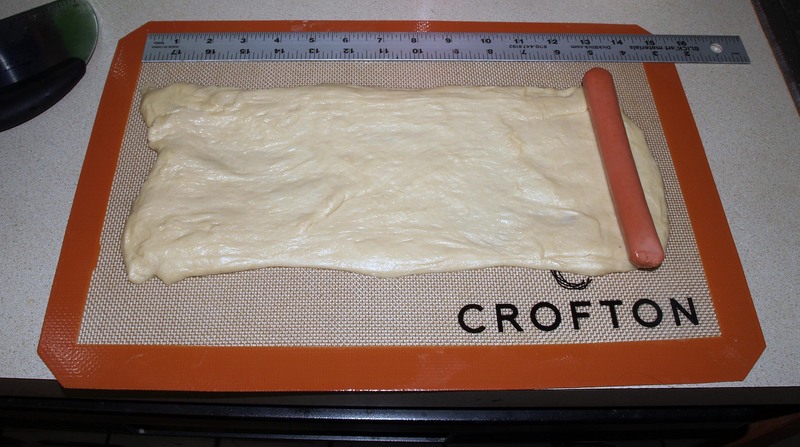 If you are making full-size bagel dogs, place a hot dog on one short end of the dough. 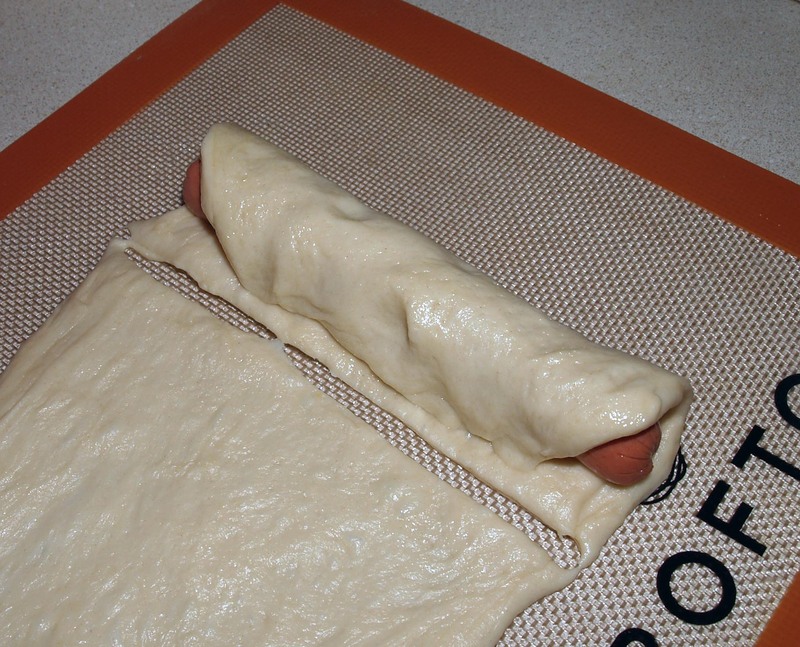 Roll the hot dog inward, wrapping the dough around it as you go. When the dough completely encases the hot dog, cut it off where the end meets. Press the seam together until it seals and transfer the bagel dog to a greased cookie sheet. 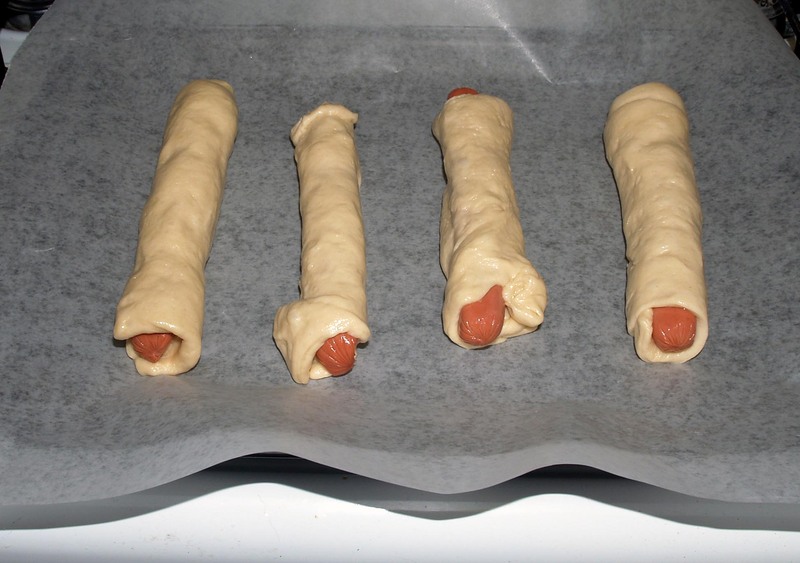 Repeat the process until you use up all of your hot dogs (I was able to get 4 bagel dogs per quarter portion of dough). I should note that I left my bagel dogs to rise on waxed paper, which didn’t work out too well. The bagel dough stuck to the paper, so it stretched and tore a bit when I tried to take them off. This probably wouldn’t have been as much of a problem if I had greased the cookie sheet, so in the future, I’d definitely do that instead. If you are making mini bagel dogs, cut the rectangle of bagel dough into strips approximately as wide as your mini hot dogs and perform the same rolling process. Either way, leave the bagel dogs to rise for about 20 minutes on a greased cookie sheet. After the bagel dough has had time to rise, preheat your oven to 375°F and line cookie sheets with parchment paper. Whisk the remaining sugar into the 2 quarts of water and bring to a boil. 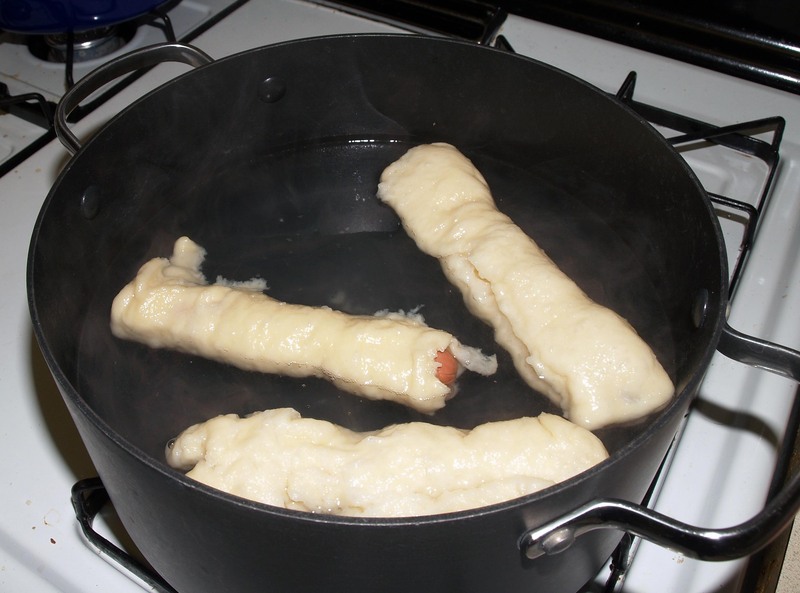 Reduce to a simmer and drop in as many bagel dogs at a time as will fit without touching. Simmer the bagel dogs for 4 minutes, turning once halfway through to make sure that the dough cooks evenly. This part can be a little annoying because they don’t always want to stay on the other side when you flip them. If that happens, try to hold them the right way with tongs for a little while so that both sides get at least some simmering time. Remove the bagel dogs to paper towels to drain and repeat the process with the remaining pieces. When you have boiled all of your bagel dogs, whisk the remaining egg yolk together with 1 tablespoon of water in a small bowl. Brush the tops of the bagel dogs with egg wash while they are still sitting on the paper towels (do this now so that you don’t get drops of egg on the cookie sheets, which will burn during baking). 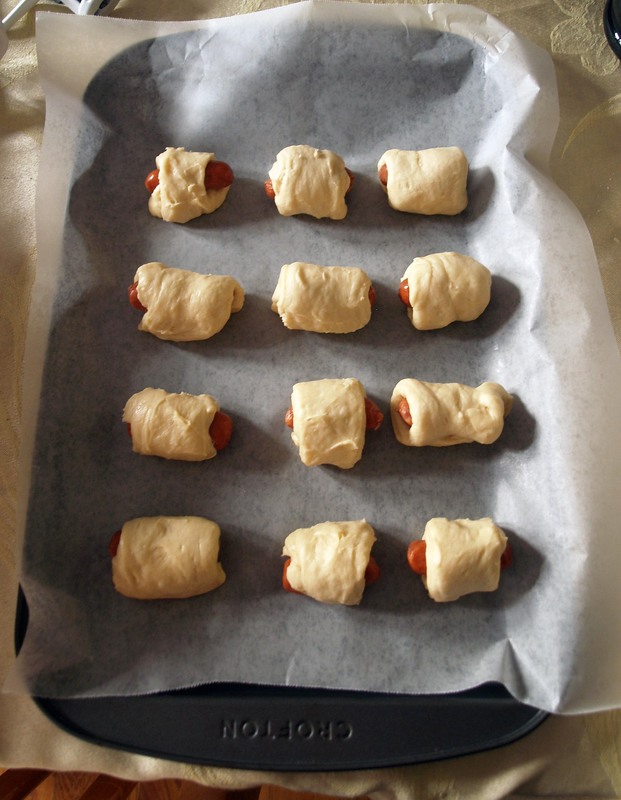 Transfer the bagel dogs to the prepared cookie sheets and bake them until they are golden brown, 20-25 minutes for mini bagel dogs or 25-30 minutes for full-size bagel dogs. Leave the bagel dogs to cool for at least 10 minutes, then transfer them to a plate and serve warm with your condiments of choice. Alternatively, you can freeze them as described in the introduction.